I've heard it said that Heaven must be a fantastic place. People are dying to get there. All your problems fade into insignificance, or disappear instantly, as you step through the PearlyGates. Ditto dandruff, weak fingernails and split ends. Why does Heaven have Pearly Gates anyway? Since there's no fence, I would think you could just walk (float?) in anywhere. Yet movies and cartoons have a beautiful set of gates, with a line of souls waiting to pass through. In Heaven, you no longer need to work. You just lay about on fluffy white clouds. Maybe playing a little harp music now and again. If you get too bored just laying about, I understand that you can volunteer to polish halos, or fluff up the new sets of wings. flagged down the bus, went into the city and caught another bus. Out to Collinswood, where I stopped in here, for a burger (soggy bun, tasteless meat),and fries, (too salty). I sometimes wish I was "Big Bang Theory" smart. Most of the time I'm happy enough the way I am. But I'm not the brightest bulb in the chandelier. When I was very young, I was constantly praised by my parents for being clever. To the point where I was convinced I was practically a genius and would someday be someone very important. After all, I did learn to read when I was three. Looking back on this now, I know that I learnt to read, not by picking up a book and having the squiggles called letters suddenly form themselves into words that I could understand, but bylistening in and watching the words, as my mum spent hours and hours every single week helping my older sister learn to read. My sister is three and a half years older than me, and was born retarded. Use whatever politically correct term you wish, the meaning is the same. I'm going to make it to the Aussie Bloggers Conference!!! I'm very excited about this very first ever Aussie Bloggers event. At first I didn't think I'd make it. I looked at my budget and my heart sank faster than a lump of concrete thrown into the ocean. I did a little figuring. Tried a bit of the "rob Peter to pay Paul" type of thing. Checked the calendar for future incoming bills, like gas, electricity. Uh-Oh, two of each due between now and March. Then I remembered my last resort option. If I could manage half of the cost, maybe R (brother) could help with the rest? We don't stay in touch as much as we could, both of us being shy, and having spent much of our childhood apart, we don't really know each other. Add to that, he lives in WA, and he is away from home a lot, working in remote areas. I emailed him, crossed my fingers and hoped he would read his emails. He answered this morning. Oh joy!! He can help! 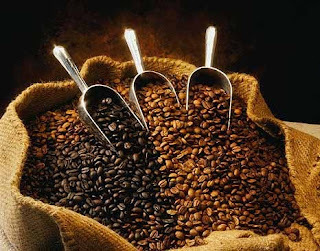 At any time during the day, no cup of coffee is as perfect as the one I make at 4am, on weekends, when I'm wide awake, but don't need to be up yet. As most of you know, I've been working the early morning shift at Coles for years now, waking at 4am, being at work by 6 or 6.30am. I don't like rushing through my mornings, so I take my time over showering and breakfast. Coles is just a 15 minute walk away. But work days do not include morning coffees. So on weekends, I still wake at 4am. This is when I make the best cup of coffee ever, and take it back to bed, with whatever I'm currently reading, and read until I get sleepy again. Or until I get up. While I was temporarily off work, I stayed up a bit later than usual at nights, thereby sometimes managing to stay asleep until 6 or 7am. My shoulder is much improved, although I still don't have the full range of movement. Still doing the exercises 3-4 times a day, they still hurt, but it will be worth it in the end. However, I've been told by my doctors to use the arm as normally as I can, as much as I can. So I've been cleared to go back to work, with restricted duties. No checkout work. I'm actually missing my "front end" workmates. This means I'm there four hours a day, four days a week, doing......well, not much of anything really. I appreciate that I can't work to my full capacity, the injury is still there, surgery is still ahead for me. But. What was I saying? Oh yes, at work. I don't really "belong" to any of the other departments, so don't properly know the work, the routines, the methods. So I'm "helping out". I'll leave you tonight with a few more of the lovely things growing around my neighbourhood. 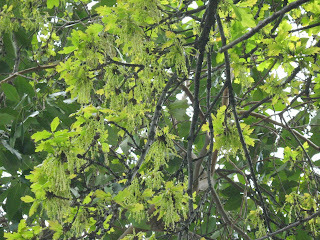 The magnificent oak trees along Queen Street all have a lovely light green covering of new leaves. Something pink, I'm not sure of the names of many things I'm putting here tonight. I have a copy of "What Flower Is That? ", but many of the pictures aren't clear to me. I have other gardening books with pictures and descriptions, but can't be bothered hauling them out and flipping pages. This unusual tree has hundreds of these dangling tassel formations. I think it's a Garrya, also known as Silk Tassel, Curtain Bush or Fringe tree. A long-ago conversation with my grand daughter. She was three, very close to four, sitting at the table while I set out plates and cutlery for dinner. GD; Nanny what is this knife doing next to my plate? Near me? Don't you know that you shouldn't put knives near small children? Because they could play with them and cut themself or get badly hurt. Me; and if you leave it alone, just don't touch it at all, you'll be fine. On Monday, after my hydrodilation, I treated myself to a Swiss Glory Chocolate bar. I don't often buy this brand as it's expensive, so I hadn't seen these bars before. Usually I buy coffee truffles or something similar and always only two. Showing great restraint here. Well as soon as I got home I had a coffee and gutsed down the chocolate without even thinking to take a photo first. 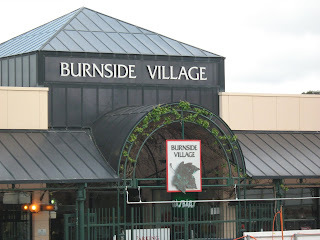 Burnside Village. It's just a short way along Portrush Road, and I've been known to walk there from my home, (takes about 45 minutes on a good day),but I caught a bus this time. The Village is even bigger than when I lived closer to it, (across the road), and now there's even more construction going on! It's HUGE! Anyway, I know there's a Swiss Glory outlet there, and that's where I was headed. I bought these three bars, milk, white and dark. "What's worse than being on the outer and no-one noticing you? Being on the outer and everyone noticing you." 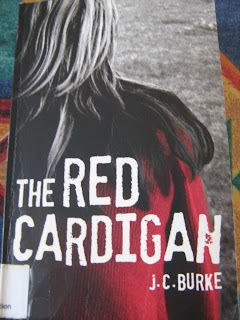 This is a Young Adult novel, not too long, being only 192 pages, set in Sydney Australia, with a crossover to Adelaide. Adelaide!! That's rare. It's quite a powerful story about a young girl, aged 16, with a passion for vintage clothing, who is discovering that she has inherited her grandmother's psychic abilities as she helps to solve a 20 year old missing persons case. It moves along at a good pace, with no annoying loose ends that cause you to flip back through previous chapters to find where your current page connects to an earlier part of the story. An easy, enjoyable read. I finished it this morning after starting it after dinner last night. It's a tale of Drug Dealing Triads in Sydney. Should be interesting. I love the title. exercise, one two,one two,one two, and a woo-hoo! This is the sheet of exercises I was given to do, to loosen up the shoulder after yesterday's hydrodilation. 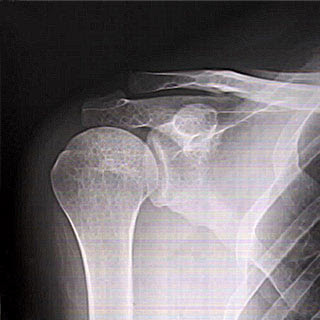 There's a whole bunch of information on what a frozen shoulder actually is. Click on picture to enlarge to read should you be interested enough. Top, pendulant exercise, lean forward from waist, swing injured arm from shoulder, back and forth, then from side to side; each being done ten times. I also swing arms in a circular motion, clockwise, then counterclockwise, just to liven things up a bit. Because I can. Bottom; flexion, lay on back, grasp injured arm with other hand, lift arm back behind shoulder as far as you can, hold five seconds, relax. Repeat ten times. While I'm down on the floor (bed, it's softer), for these, I do some leg lifts as well. Just to pass the time you understand. Plus extra work means a few extra squares of chocolate allowed, yes? This is not my shoulder, this is a googled image. Still, a bone is a bone is a bone. This hydrodilation is quite an interesting experience. 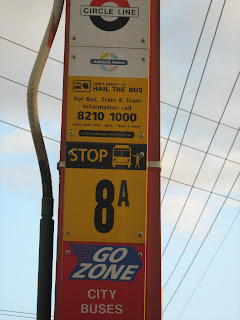 I caught a bus into the city, then walked along King William Street, over the bridge spanning the Torrens, up into North Adelaide to the Memorial Hospital. Sat in the over-warm waiting room until I was almost asleep, finally got called through. I was asked to remove all clothing from the waist up and put on the provided gown, but not tie it up. I couldn't reach back to tie it anyway. So I went through to the x-ray room where the assistant asked me to remove the robe from my right shoulder, then she tied it behind in a very stylish off the shoulder togalook. Climbed up onto the very narrow table and laid on my back. The equipment is so very different from any x-ray room I've ever seen. There's no sliding in and out of x-ray plates and staying still while the technician goes into the other room to take the picture. No No No. There's to be a first everAussie Bloggers Conference! This wonderful happening is the brainchild of Veronica of Sleepless Nights fame and some of her best friends. There is a link to the details on her blog. It's to be held in Sydney, in March 2011. Tickets are on sale now at a special early bird price, only available at this price until October 3rd. There will be speakers on a variety of blogging subjects. I'm guessing there will also be meetings, greetings, exclamations, "oh! so this is what you look like! ", and even, "so lovely to meet the face behind the blog". Hugs, laughter, much chatter, lots of photographs. I'm hoping to go, but my budget is a bit up in the air at the moment. There's going to be a bit of robbing Peter to pay Paul type of stuff going on here as I rearrange this and that dollar. It promises to be very exciting for all who attend. And everywhere things are growing and blooming. Gardens are a riot of colour and new growth. 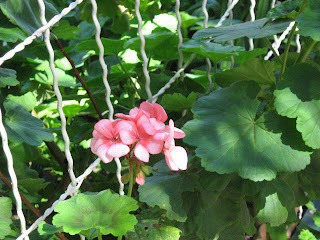 Pink geraniums enjoying dappled sunshine. Red geraniums boldly turning their faces to the full afternoon sun. The pretty pink-purple pea flowers of the polygala shrubs so popular in many suburbs. and lavender is too, with bees foraging for the nectar. So many bees this year. This very pretty, (but oh-so-deadly-to-me), jasmine. One of many varieties, this one is Jasminum Polyanthum, also called pink jasmine, night blooming, or night scented. The fragrance from this one is released at dusk, to hang heavily in the air all night and well into the morning, often spreading as much as half a city block or more. This one plant, more than any other, causes me to lock myself inside as much as possible for its long blooming period. I'm allergic. And it's grown in every suburb. I don't think Adelaide has even one suburb where this jasmine isn't grown. I picked this up from the library this morning and have been reading it all day. 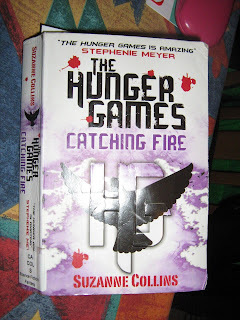 The Hunger Games-Catching Fire is the second book in the Hunger Games trilogy, set in post-apocalyptic America. Book one is titled simply The Hunger Games, book three is titled Mockingjay. I'm not sure what age group this is aimed at, there are readers younger than me reading it, my daughter is reading the trilogy, I'm 58 and enjoying it too. The books centre on a handful of characters, most of whom are from "District 12". In this series, America appears to be run by "The Capitol", a futuristic city where the inhabitants have as much of anything that they could possibly want and more, while outlying "districts" numbered 1 to 13 are kept in near starvation with little or no utilities or other facilities according to the whims of The Capitol. Each district is responsible for their particular specialty, for instance mining or grain crops and so on. Pictures courtesy of the LOLcats website, thank you lolcats. and some of this: more stretching and holding, sets of 10, three times a day. Of course, I'm focussing on the shoulder, but I've noticed other muscles are being called in. 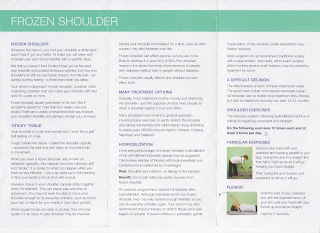 It's impossible to move the shoulder in the ways indicated on the sheet I've been given, without moving the back muscles too, and bracing the legs, holding firm so that the body doesn't twist while pushing/pulling the arm/shoulder to the left or right, up or down. After a month of protecting the shoulder, I'm told I can use it as normally as possible to encourage it to move. So I pegged out my washing, carried home a lightweight bag of library books. Only two books, that's light, right? I had an appointment with an orthopaedic surgeon today who examined my shoulder and pronounced it frozen. There's a torn tendon in there, so I've been off work and not using the shoulder, because it's painful, but not using it has caused it to freeze. More than it already had. So I'm to have an injection on Monday, (ouch!) and I have a series of exercises to do three times a day to get the shoulder moving again. Apart from that I'm to use the arm as normally as I can. Then, next month there's another appointment with the orthopaedic surgeon, if the shoulder shows more flexibility, the repair to the tendon becomes possible. Several people have put up photos of their desks and I always enjoy seeing where the blog comes from that I'm currently reading, so thought you all might be the same. So here are some photos of my workspace. 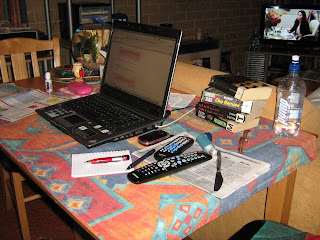 This table is a multi-purpose piece of furniture, it's where I do all my computer stuff, read, do crosswords, eat meals, and watch TV too. It's not too messy right now, a stack of library books, remotes for TV and dvd player, my inhaler is close by since there's so much pollen around right now. Usually there's a dinner plate and coffee mug crowded on there too. There's a couch directly in front of it, that's where I sit after the computer is shut down for the night. Here's a view from the other side, there's the fishbowl, the ever present tissues, (achoo!! ), the latest copy of "That's Life", because the puzzles in that are really easy, so make me feel good about myself when I get them all done in just an hour or so. 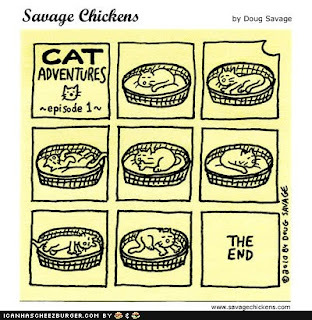 A long time ago, I was reading over at lunatic-kate and came across a list of funnies that made me laugh. Here are some of them and I hope they make you laugh too. My husband and I divorced over religious differences, he thought he was God and I didn't.I don't suffer from insanity; I enjoy every minute of it.Some people are alive only because it's illegal to kill them.I used to have a handle on life but it broke.You're just jealous because the voices only talk to me.Out of my mind; back in 5 minutes.God must love stupid people; he made so many.Consciousness: that annoying time between naps.Wrinkled was not one of the things I wanted to be when I grew up.A hangover is the wrath of grapes.He who dies with the most toys is nonetheless DEAD.Ham and eggs; a day's work for the chicken, a lifetime commitment for the pig.The trouble with life is there's no background music.I smile because I don't know what the heck is going on. My hubby, L, used to love going around the streets every year during hard rubbish collection time. He'd bring home all kinds of stuff that he thought would be useful. Half used cans of paint, old prams, boxes of nuts, bolts and screws, etc. Most of these things ended up back in our own rubbish pile or just straight into the bin. But there were a few things that made it into the garden as art. Broken or weathered statues for instance. 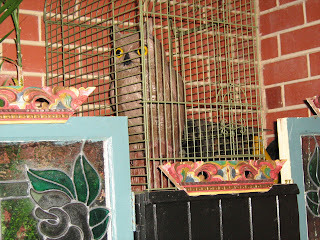 This owl pictured below came with bits chipped out and no colour on him. He was fixed with plaster left over from another project and painted with old paint that someone had thrown out. The cage he's in was another find. The two pieces of stained glass window you can see once adorned the prettiest little garden shed I've ever seen.